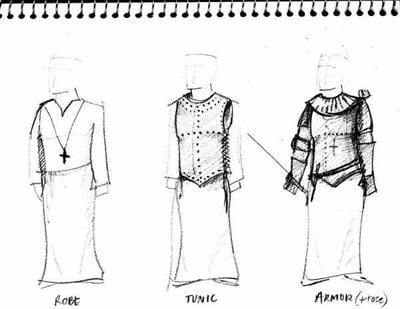 When we go to the theatre we expect the costumes to be appropriate to the period in which the play is set, and the different characters will wear costumes that express their individual status of class, nationality and so on. 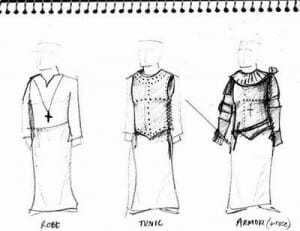 But in Shakespeare’s time there were certain difficulties regarding theatrical costumes that we don’t encounter today. The Globe theatre had a collection of costumes that were highly prized because of the enormous cost of clothes, particularly the garments that had to be worn by actors playing kings, queens and noblemen. The costumes weren’t always the clothes of the period that the play depicted and the actors generally wore the dress of their time. The theatre sometimes saved money because rich patrons would donate their used clothes. However, Elizabethans couldn’t just wear what they liked, as we can today. There were strict rules about who could wear what. Certain textures and colours could only be worn by noblemen, and that was reinforced by the Sumptuary Laws to ensure that a peasant or merchant couldn’t be mistaken for someone of the upper class. Those laws were rigorously enforced and the penalty for breaking them was harsh. There were even cases of the death penalty being imposed for wearing clothing that only the upper class was allowed to wear. There was an exception in the statute though: the Queen could grant licenses to aristocrats that enabled their servants to wear aristocratic clothes, like liveries, on their behalf. The Globe’s patrons were licensed and so the actors, their servants, could wear appropriate costumes on the stage without fear of prosecution. And so audiences could enjoy the fashion parade, with actors dressed in silk, fox, velvet and lace, as the characters acted out their roles in the performance. Forensics to Finally Uncover the Face of Shakespeare? Shakespeare’s “Real” Ophelia Finally Revealed?